Posted on April 9, 2016 by Mike Sonnenberg Posted in Michigan Historical Markers	. In 1903 Mary Chase Perry (Stratton) and Horace Caulkins founded Pewabic Pottery in a stable near downtown Detroit. Four years later, the present building was constructed a pottery works in the style of an English inn. Pewabic Pottery was part of the early twentieth-century Arts and Crafts design movement, which shunned machine-made products and championed the return of craftsmanship. Pewabics handmade ceramic wares became famous nationwide for their quality and brilliant, iridescent glazes. The companys architectural tiles were used in numerous public and private buildings including Detroits Guardian Building and the National Shrine of the Immaculate Conception in Washington D.C. Pewabic Pottery is a National Historic Landmark. Mary Chase Perry was born in 1867 in Hancock, Michigan. By age ten she had moved to Detroit. She studied china painting and sculpture at the Cincinnati Art Academy from 1888 tom 1890. In 1903 Perry co-founded a pottery in Detroit and named it Pewabic after the Upper Peninsula copper mine near Hancock. She later married architect William B. Stratton, who designed the Pewabic Pottery building. During her prolific career, Perry developed new, iridescent pottery glazes, taught and wrote widely about ceramics, and was awarded honorary degrees from the University of Michigan and Wayne State University. She died in 1961 at age ninety-four. 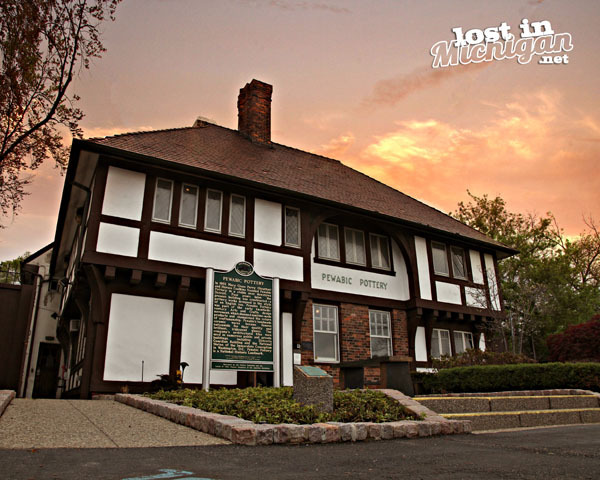 Pewabic Pottery celebrated its centennial in 2003.